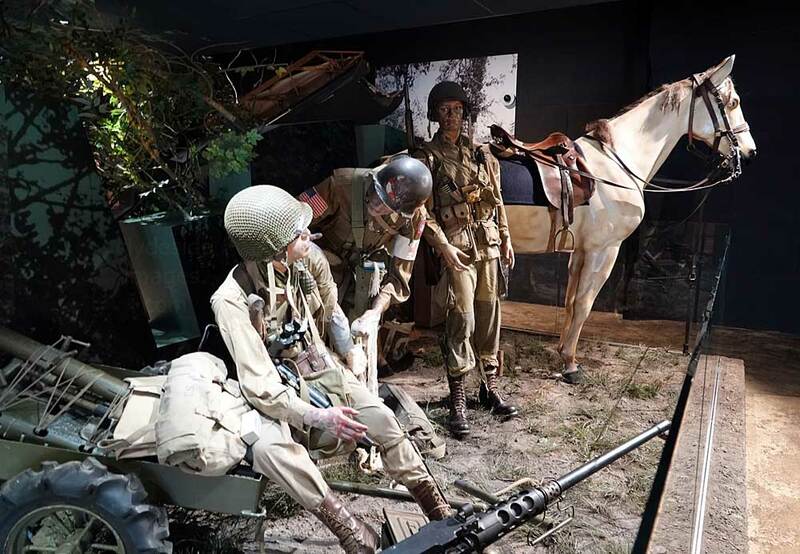 When 6 June 1944 was just minutes old, around the same time as their British counterparts at the opposite end of the landing grounds started their attacks near Caen, the men of the US 82nd and 101st Airborne dropped from their C-47 transport planes in the western sector to secure the narrow exits from UTAH Beach. They were also to seal-off the Cotentin at its base to isolate the German garrison at Cherbourg, and thus prevent its reinforcement. It was vital that the bridges and causeways over the rivers and flooded fields immediately inland from UTAH Beach be held to enable troops and armour landing there to cross and fan out into the interior of Normandy. 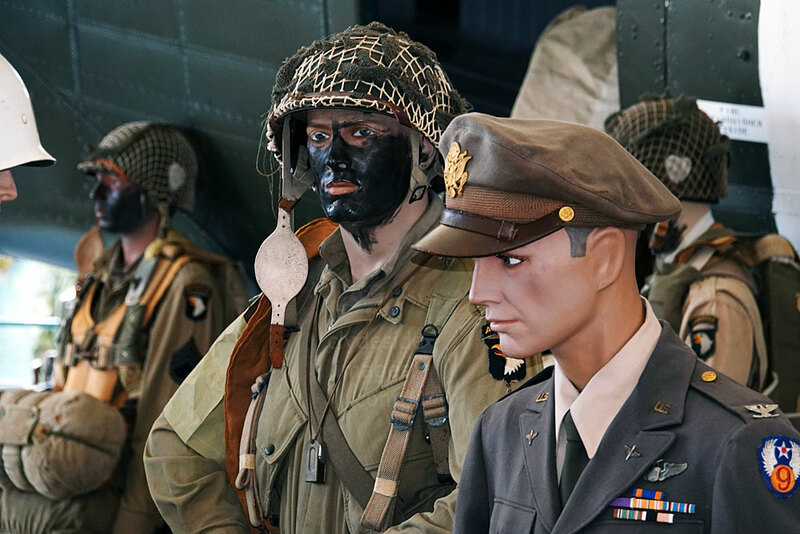 The American airborne assault on its own would be the largest ever attempted with six parachute infantry regiments (PIRs), making a total of over 13,000 men counting the attached arms and support services. 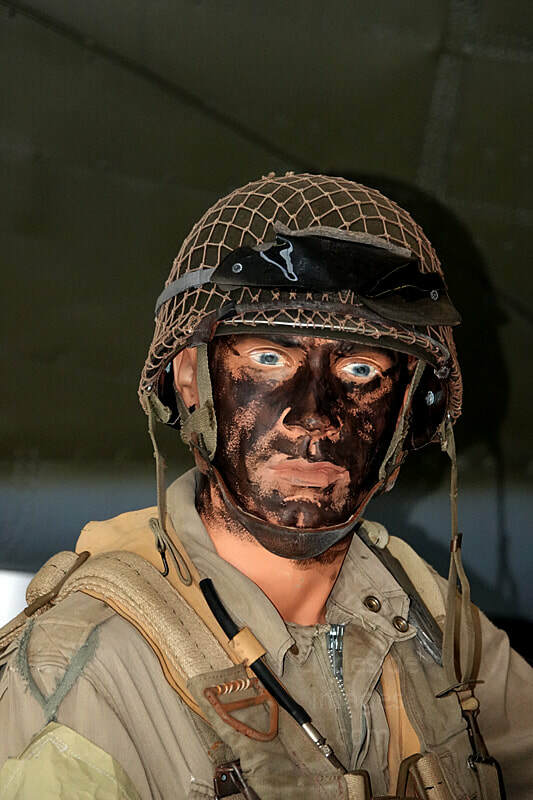 The US parachute assault alone needed over 820 transport planes. 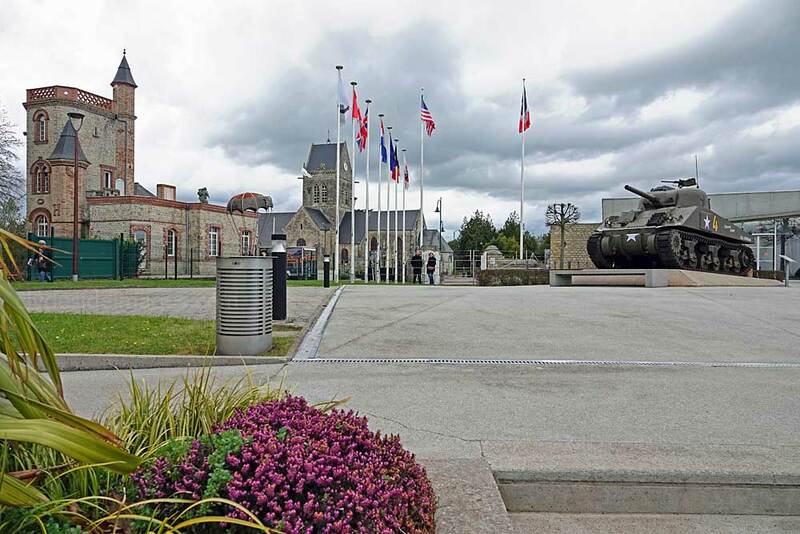 Control of St Mere Eglise was equally important to the Allies and the Germans. 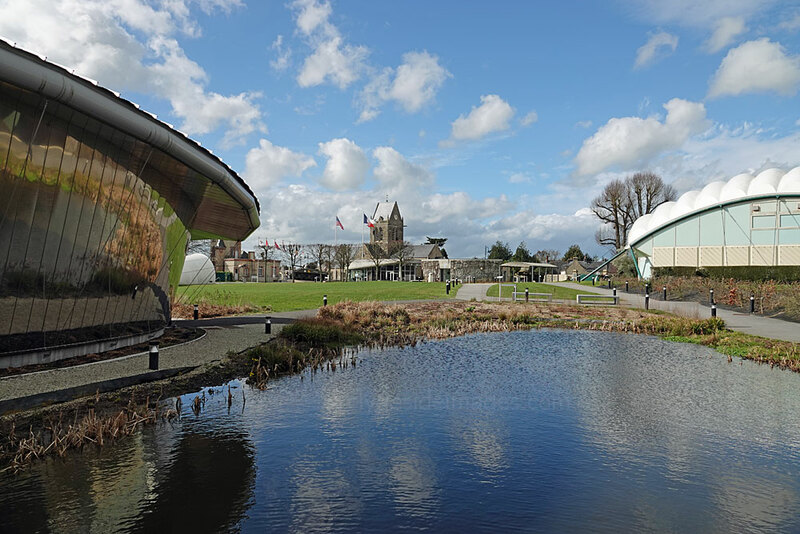 The town lies in a flat area of the Cotentin peninsula known locally as le Plain, which is bounded on the west by the River Merderet and by the English channel to the east. The communes of Valognes and Carentan lie to the north and south respectively. 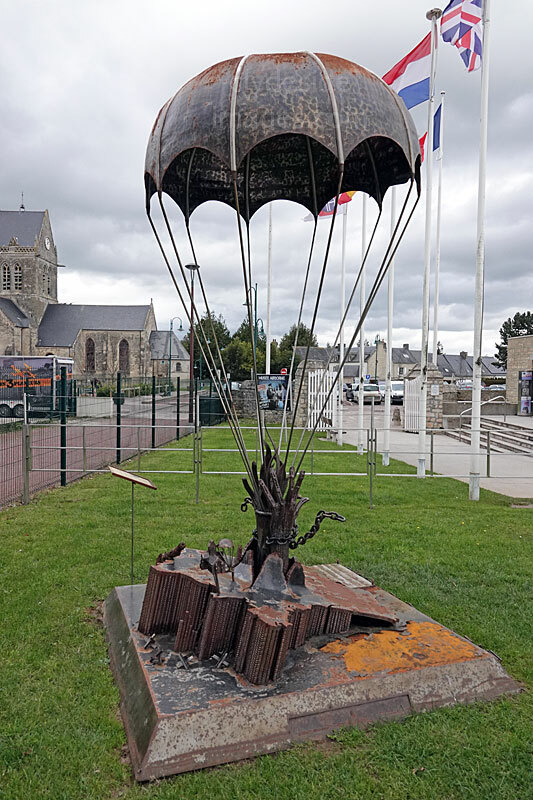 If the US Airborne dropped on either side of the Merderet and secured Sainte-Mère-Église, this would cut the road and rail link to Cherbourg. Route N13 runs through the centre of town and this would have most likely been the approach chosen by the Germans during any significant counterattack on the troops landing on UTAH and OMAHA beaches. 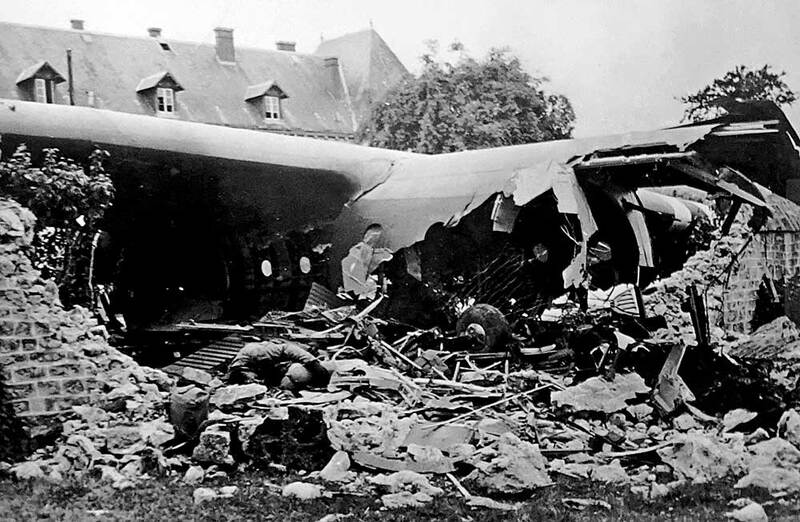 Banks of fog, low cloud, heavy flak and many inexperienced pilots meant that most troops were dropped well away from their intended targets and others perished after jumping when their C-47 Skytrain (known to the British as the Dakota) was flying too fast or too low. Some men’s parachutes didn’t even have time to open before they hit the earth. 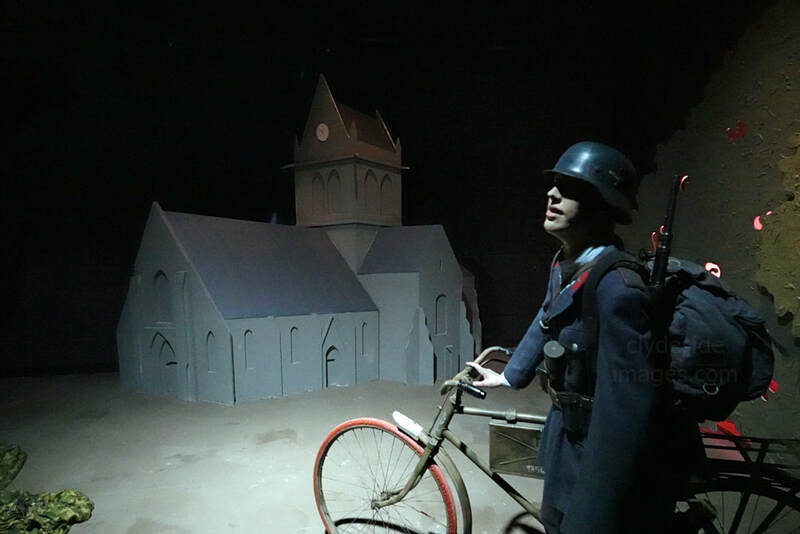 Around midnight (02:00 hrs UK time), the German garrison and residents of Ste-Mere-Eglise heard loud drones overhead and stared skywards. ​A house had been set on fire earlier in the evening and a German officer had given the town’s Mayor, Alexandre Renaud, permission to rouse the local populace and have them attempt to extinguish the blaze. The priest rang the church bell as people formed a line from the village pump and passed filled buckets along to those at the front. The blaze provided enough illumination to reveal the first of hundreds of parachutes falling from the sky. 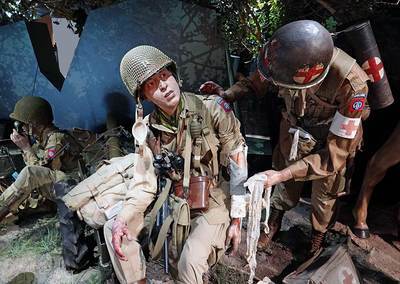 The scene has been recreated in the Airborne Museum. 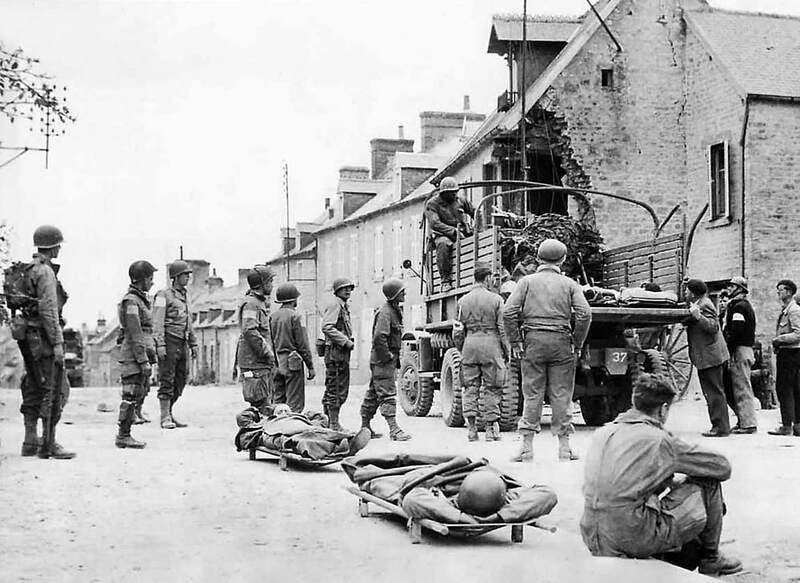 Two sticks from the 506th PIR landed to the east of the town and several men were shot. Then, shortly afterwards even more men descended, this time heading straight for the main square only to be picked off by the Germans. 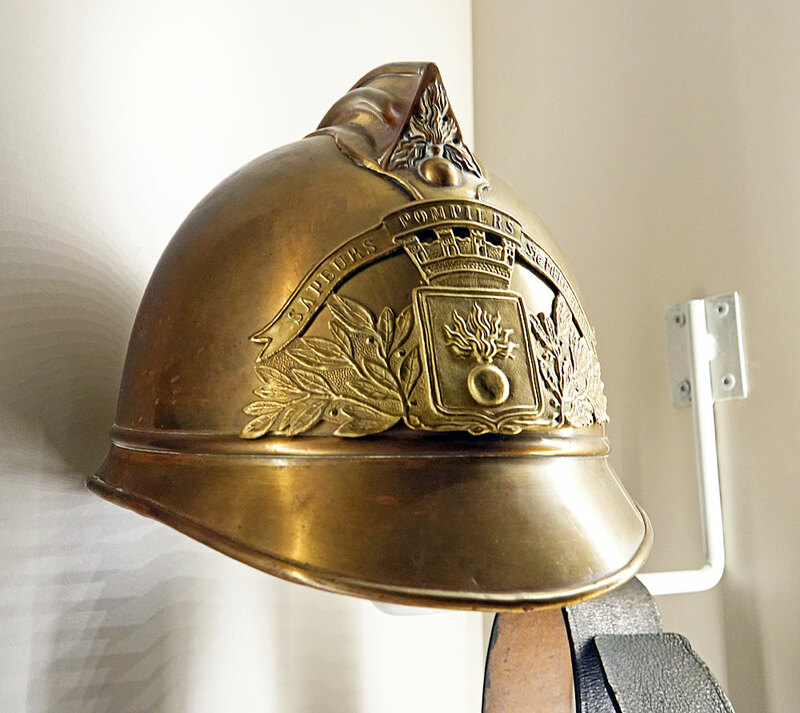 A helmet worn by one of the town`s firefighters is on display in the Airborne Museum and the famous water pump, now within the museum grounds, was where the line of townsfolk formed and passed buckets of water to extinguish the blaze in the house on the far side of the square. 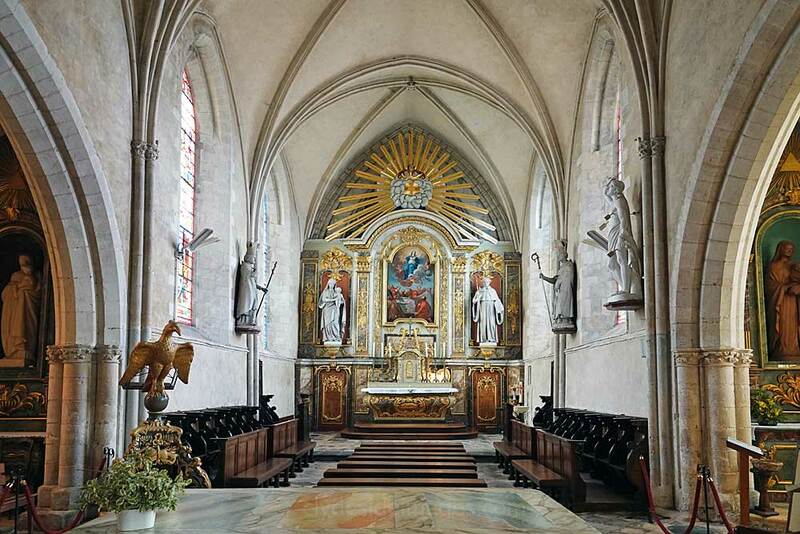 ​Sainte-Mère-Église Church was built in the 12th century. 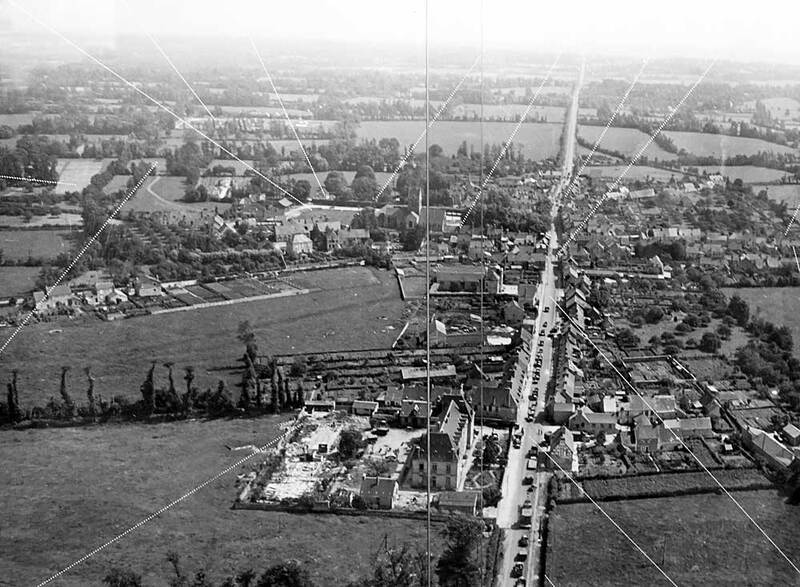 Below: This aerial photograph of St Mere Eglise was taken after its capture. 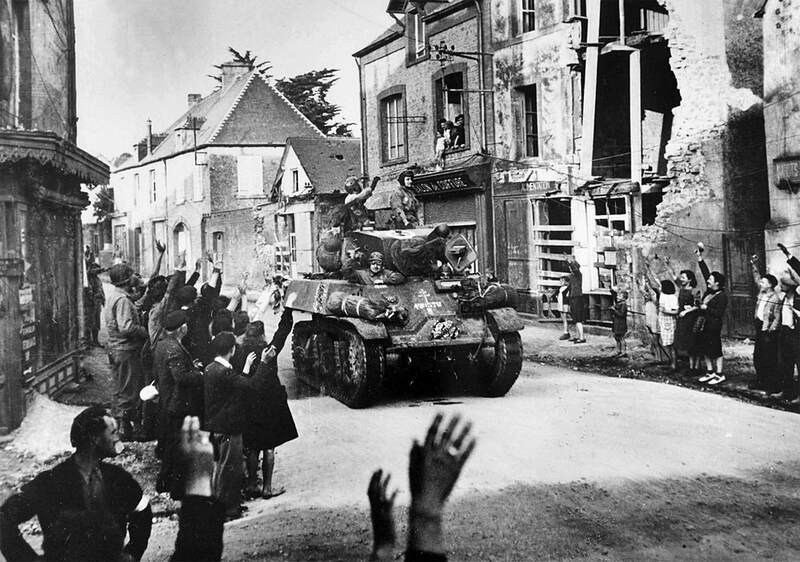 US Army vehicles can be seen on the main road which leads south to St Come-du-Mont and Carentan, both indistinguishable in the far distance. The famous church is in the centre of the shot. The large building in the foreground is the local hospital. 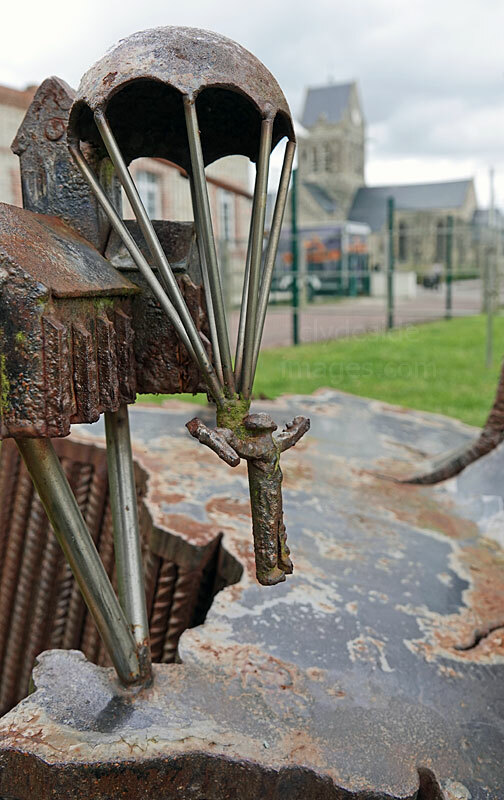 ​UTAH Beach is off to the left with La Fiere off to the right. ​The intense heat sucked any nearby chute towards the fire and several men struggled to steer their’s clear, unfortunately not all successfully. 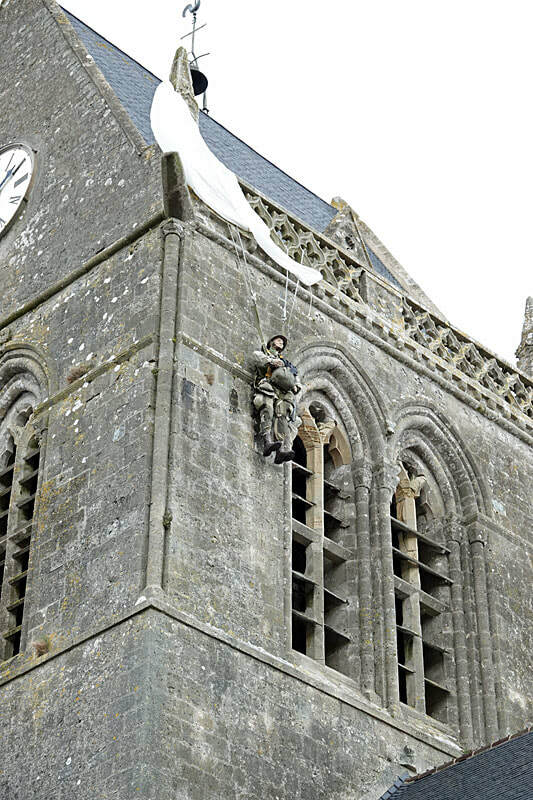 Two men, Private Ken Russell and John Steele, came down on the church roof with their suspension lines draped around the steeple. 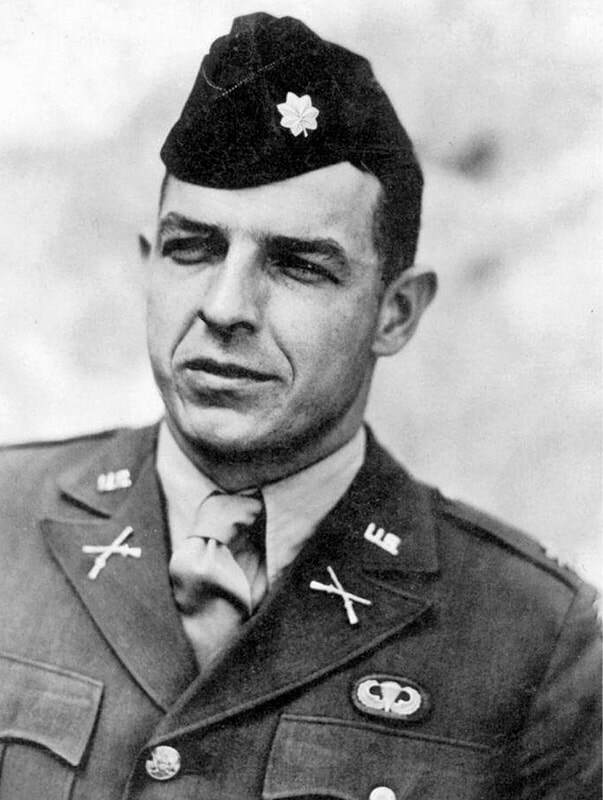 ​One German ran over and started firing, initially shooting at and fatally wounding a third US trooper, Sgt John Ray, who had landed in the churchyard directly below. Just as the German was taking aim on the trapped men, Ray, as his life ebbed away, drew his .45 pistol and killed the enemy soldier, effectively saving the lives of his comrades. 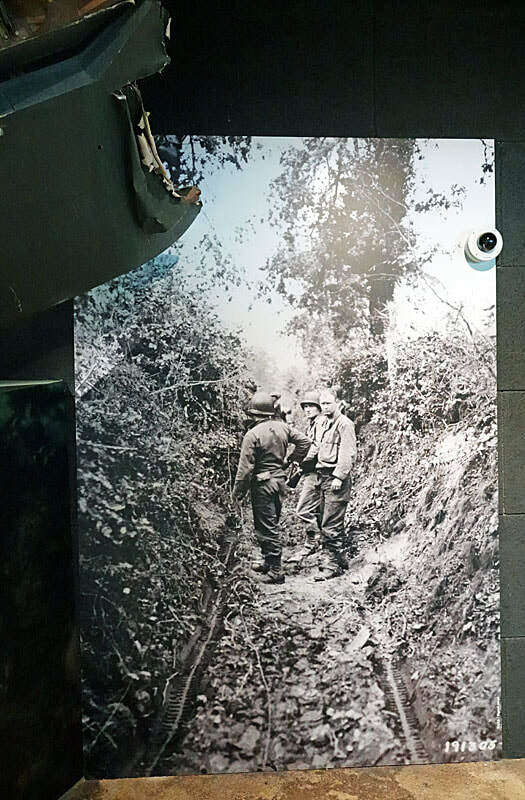 ​Russell eventually managed to cut the ropes with his trench knife and slide down the tiles but Steele remained entangled and ‘played dead’ which saved his life. 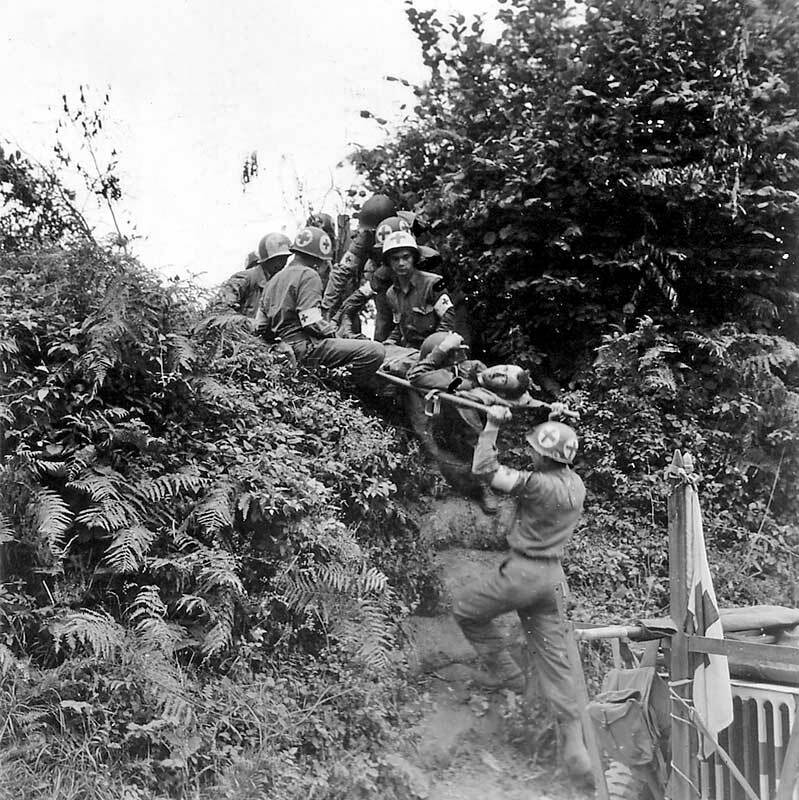 The Germans cut Steele free a couple of hours later and took him into captivity, however, he managed to escape later during the confusion when a larger group of Paratroopers attacked the village. 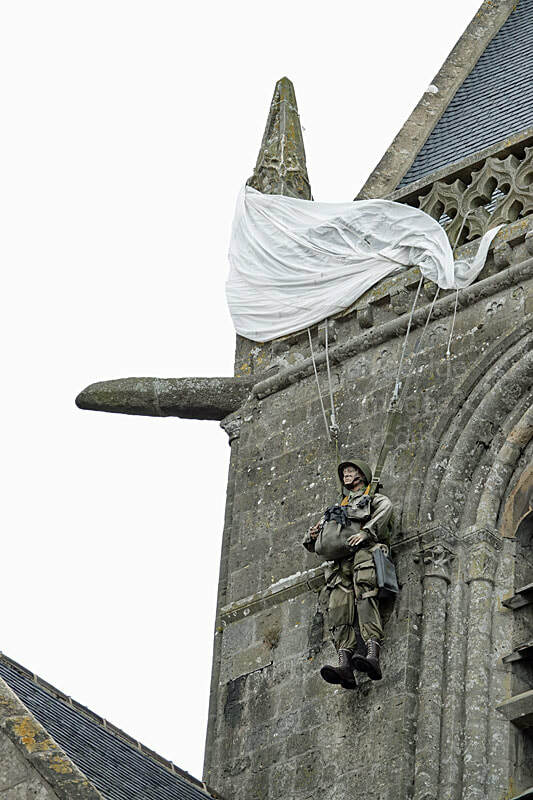 Steele’s predicament soon became one of the iconic tales of the Invasion and a life-sized uniformed figure now hangs from the church steeple in his honour for most of the year. 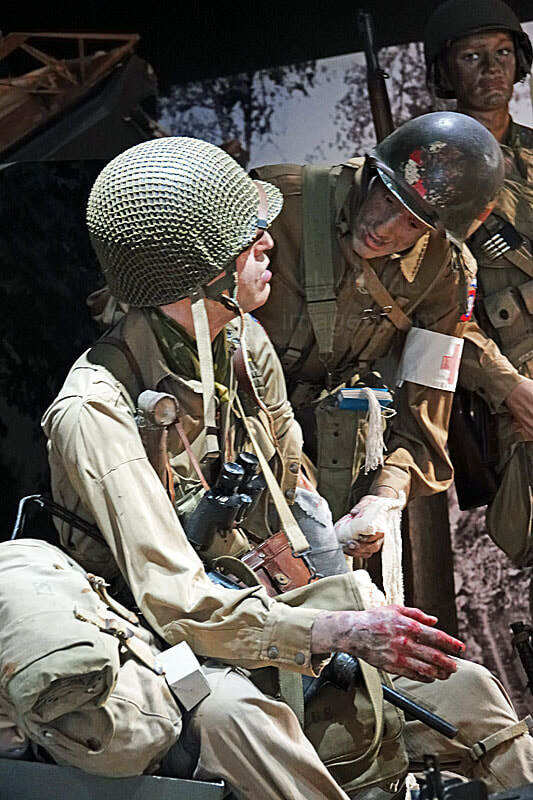 ​The exact number of paratroopers who came down in Sainte-Mère-Église itself is unknown, but later estimates give the number as no more than 30, with about 20 of these men landing in and around the church square. 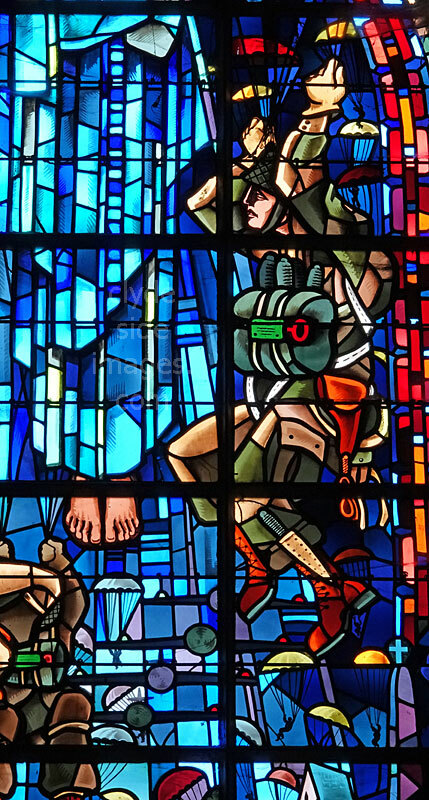 The men who came down on the outskirts of town and in the surrounding countryside began to group together while confusion reigned in St Mere Eglise. 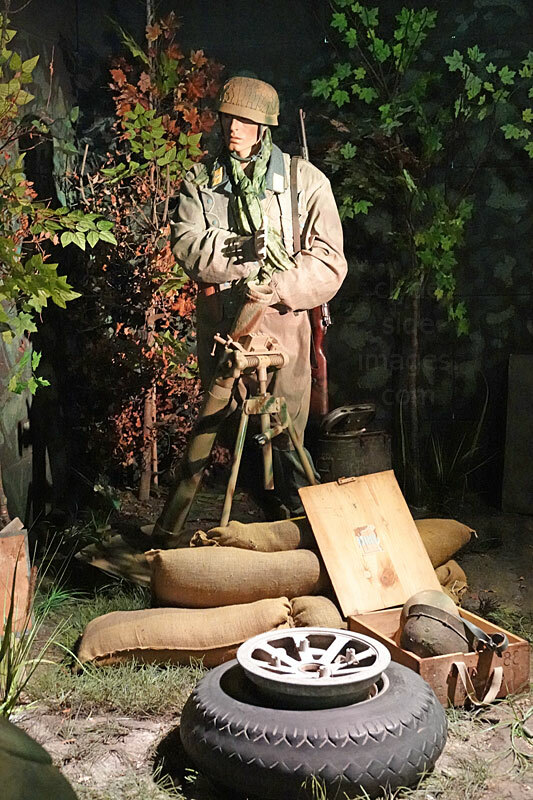 Within a relatively short time, Lieutenant Colonel Ed Krause had amassed almost 200 men, some of whom cautiously started to work their way towards the centre in the darkness. As the Americans crept into town, checking buildings as they went, it looked like everything was over; the fire was out, the residents had returned to their homes, and the German soldiers had also vacated the main square, apparently unaware of the scale of the attack. Smoke still filled the air and the bodies of dead paratroopers hung from trees and telegraph poles or lay sprawled in the street. 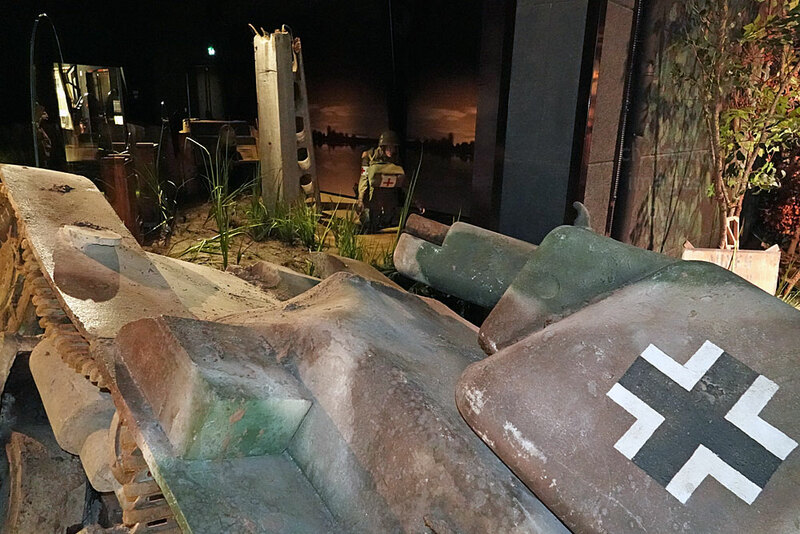 One building was identified as an enemy barracks and 10 of its occupants were killed before the remaining 30 surrendered and were taken prisoner. 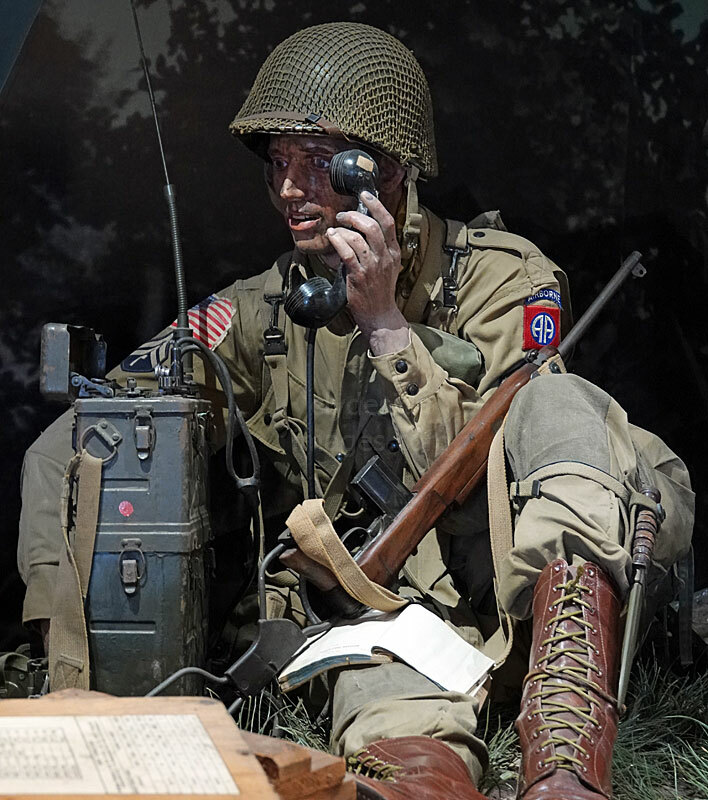 The main phone line to Cherbourg was cut and a perimeter established with increasing numbers as more men found their objective. All the men could do now was wait for the inevitable German onslaught. 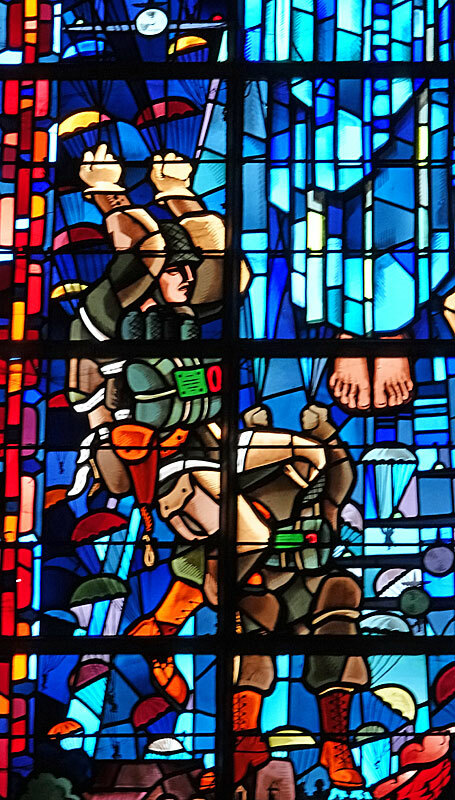 The church has several stained glass windows honouring the men of the US Airborne Divisions who fought in Normandy and ​the Sainte-Mère-Église coat of arms now includes a graphic of the famous building with a parachute supporting a silver star descending on either side. This full-sized, very realistic replica of a WACO glider is on display within the Airborne Museum. Even the interior has been convincingly recreated, complete with armed assault troopers. 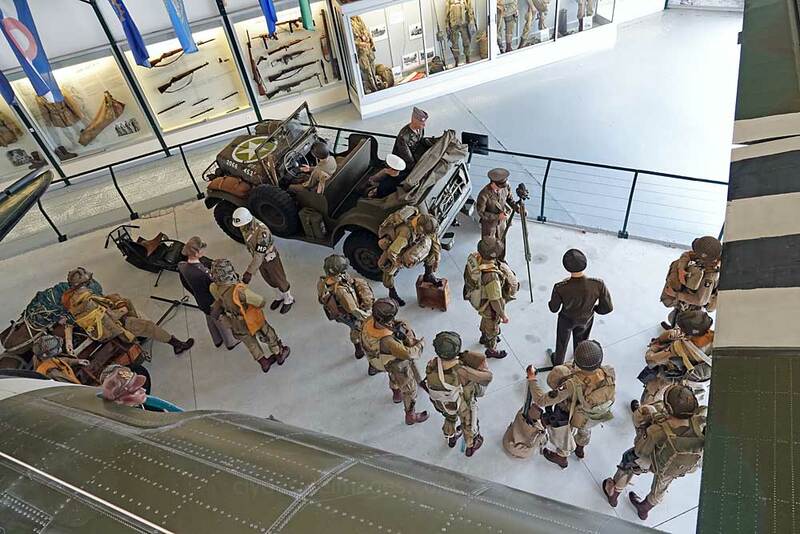 A wealth of equipment, weapons and other artifacts relating to the D-Day missions can also be viewed in the purpose-built building. 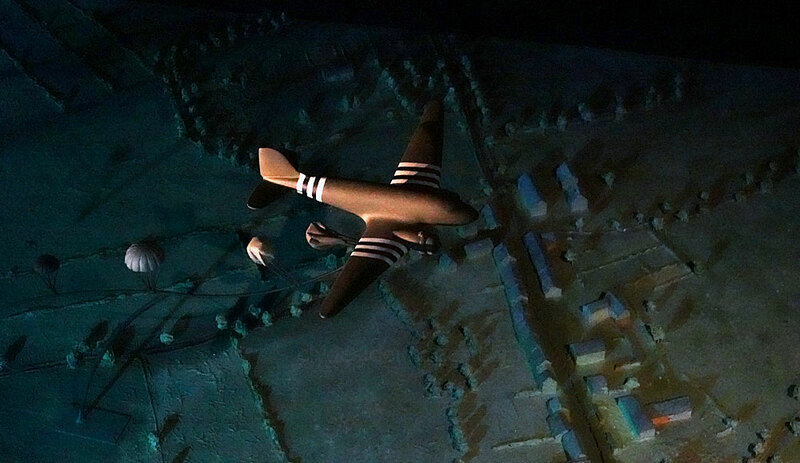 Right: C-47s towing WACO gliders over the flooded Normandy plains. 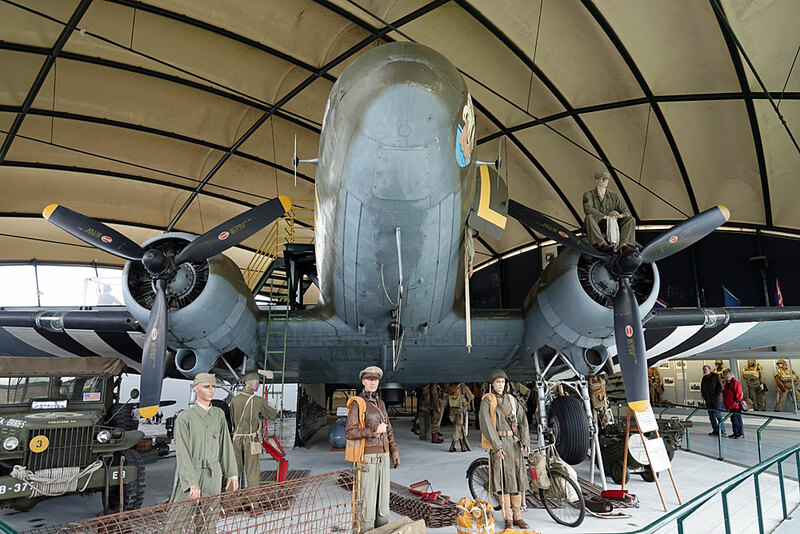 The Douglas C-47 Skytrain or Dakota (RAF designation) is a military variant of the civilian DC-3 airliner. ​Well over 10,000 were built. and the type was used extensively by the Allies during World War II. In Europe, the C-47 and a specialised paratroop variant, the C-53 Skytrooper, were used in vast numbers in the later stages of the war, particularly to tow gliders and transport men of the Airborne regiments. 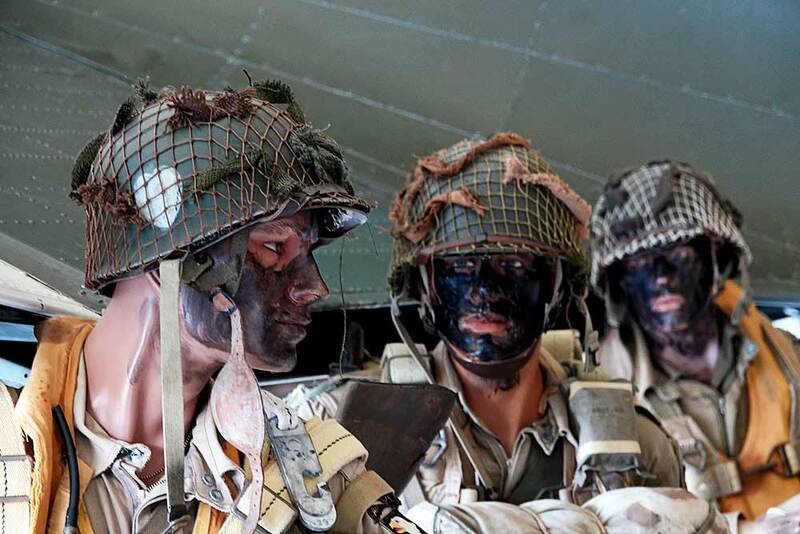 More than 50,000 paratroops were dropped into Normandy by C-47s during the first few days of the invasion. 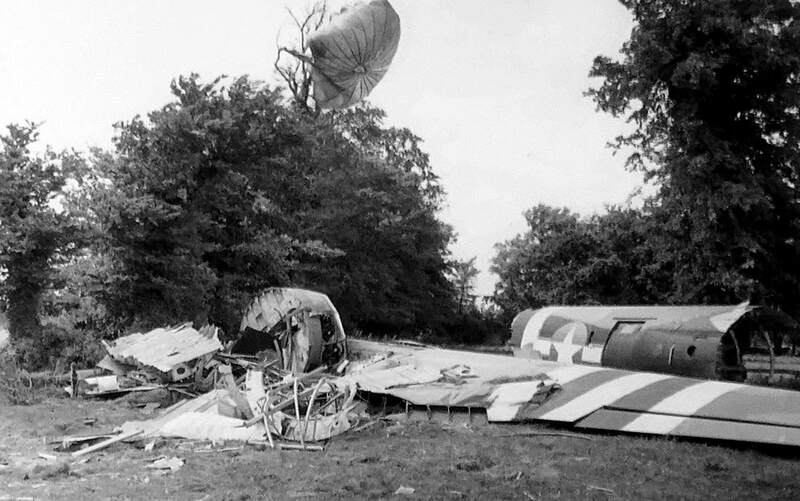 After the initial night drops, many of the Airborne troops following on in gliders lost their lives before seeing action. When the WACOs or Horsas with Jeeps or heavy equipment on board came to a sudden stop, the cargo would often break loose from the plywood floor during impact and shoot towards the nose, crushing everyone in its path. 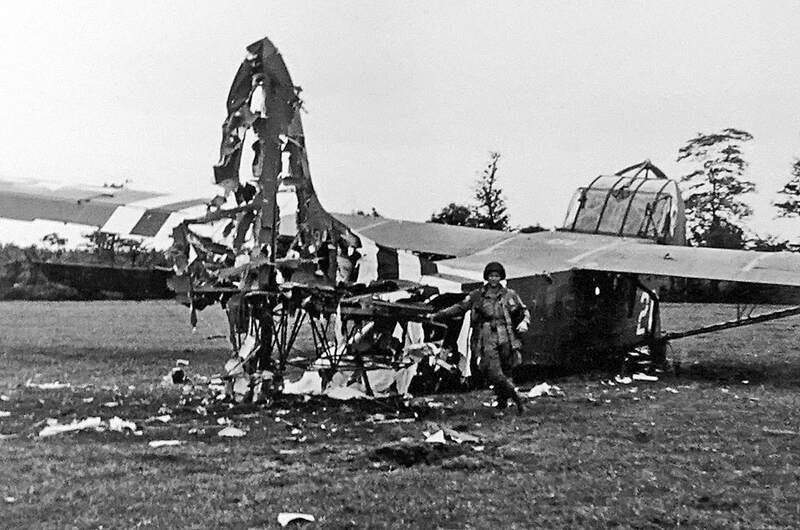 Other gliders crashed into power lines, buildings and obstacles positioned in fields by the Germans specifically to deter such landings. 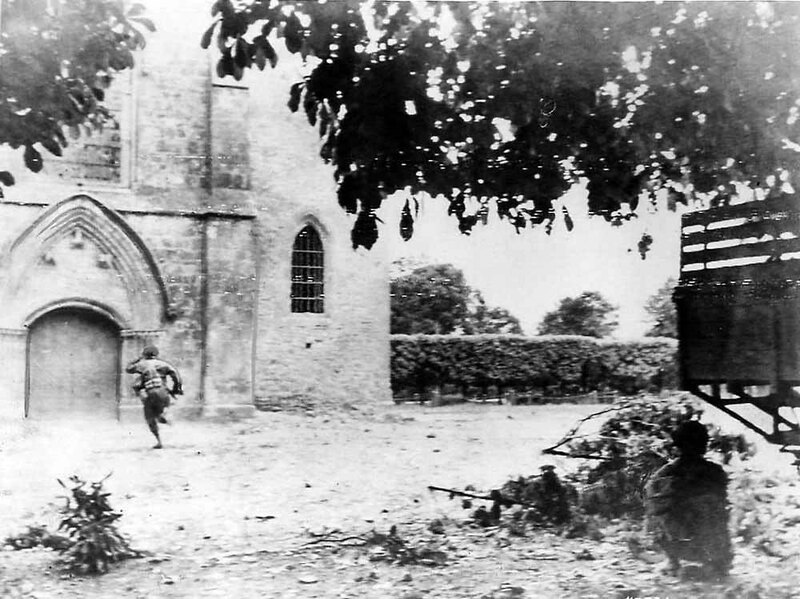 Above: German forces gather and move into position to counter the airborne landings while (below) a US Paratrooper makes a dash for cover in St Mere Eglise during an artillery barrage. The soldier just right of centre in the above photo is carrying a Panzershreck. 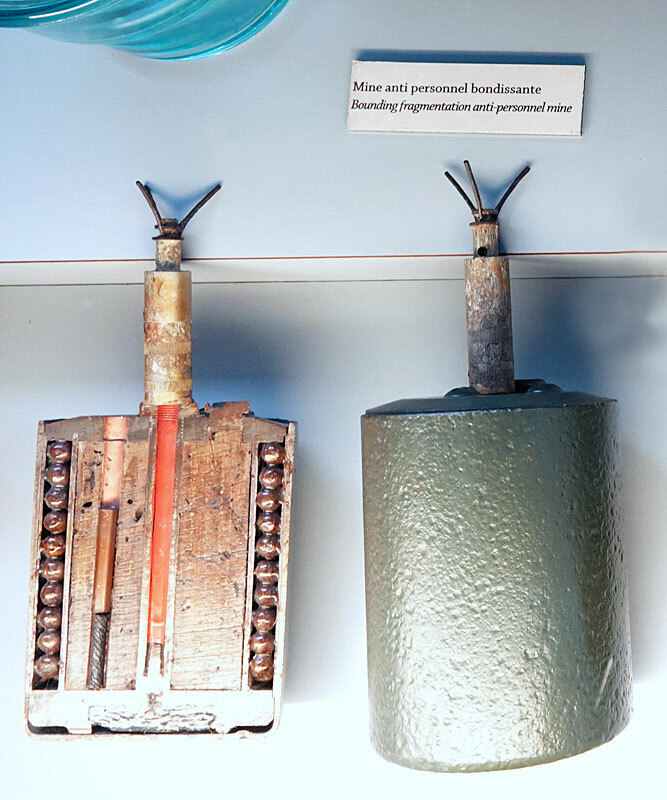 This portable anti-tank weapon, and the smaller single-shot Panzerfaust, proved ideal for use in the Normandy Bocage country. 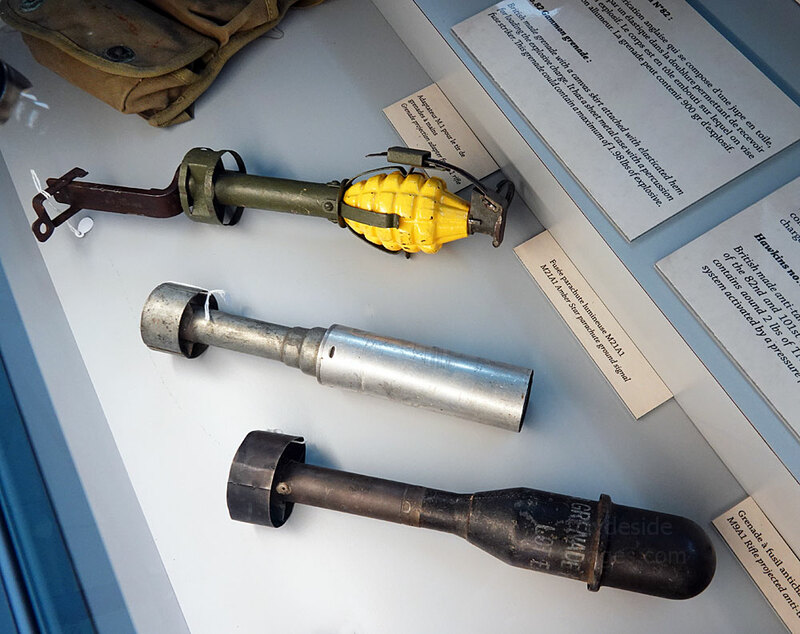 The Panzerschreck was developed from captured American bazookas but fired a heavier, 88mm projectile. 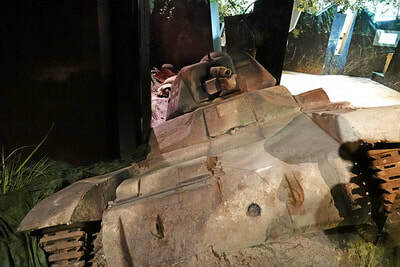 Well camouflaged Panzerschreck and/or Panzerfaust teams would often lie in wait and ambush Allied armour at close range from multiple directions. ​By the next day, June 7, Sainte-Mère-Église was still in 82nd Division`s hands, but their hold was a tenuous one, especially if the Germans counterattacked in force. 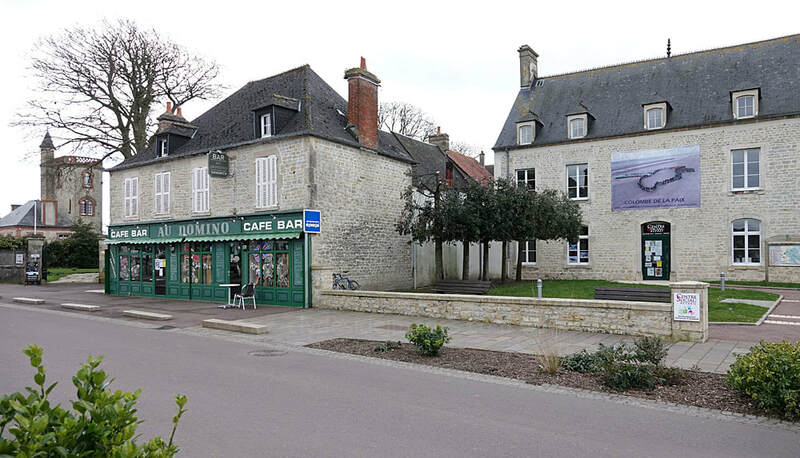 A reinforced platoon was sent to Neuville-au-Plain to forestall any attack from the north while the bulk of 2nd Battalion, along with the 3rd, remained in Sainte-Mère-Église. 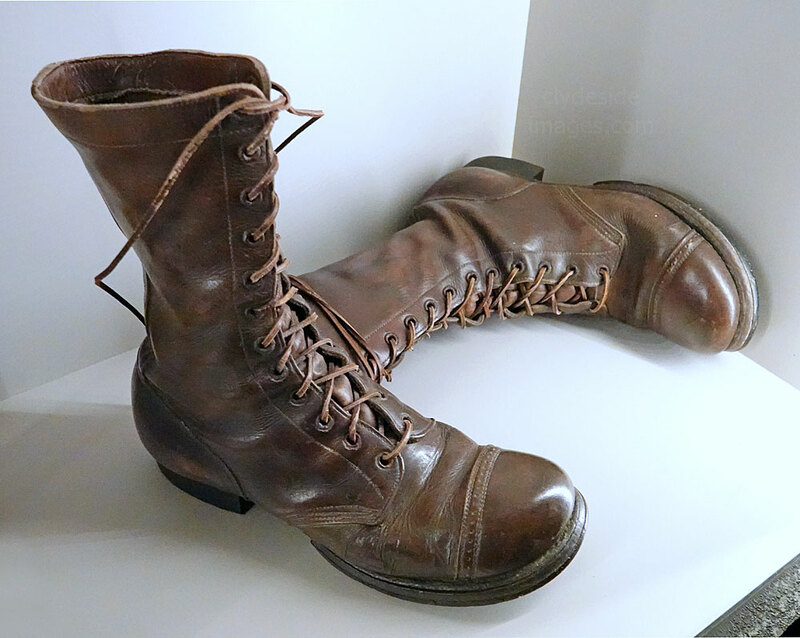 First Lieutenant Turner B. Turnbull III, a half-Cherokee, took 44 men up route N13 to Neuville-au-Plain, pushed out the German defenders, and hastily prepared for further action. 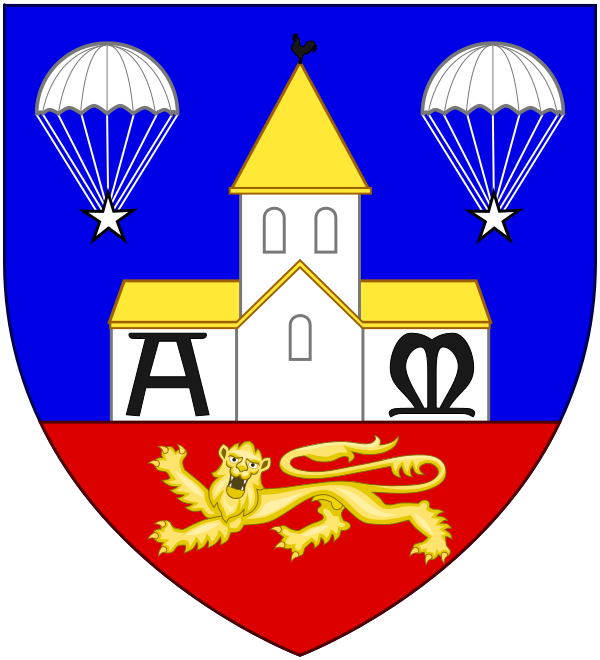 Lt.Col. Benjamin Vandervoort (right), who had broken his leg in the jump, arrived from Sainte-Mère` in a jeep towing a 57mm anti-tank gun. 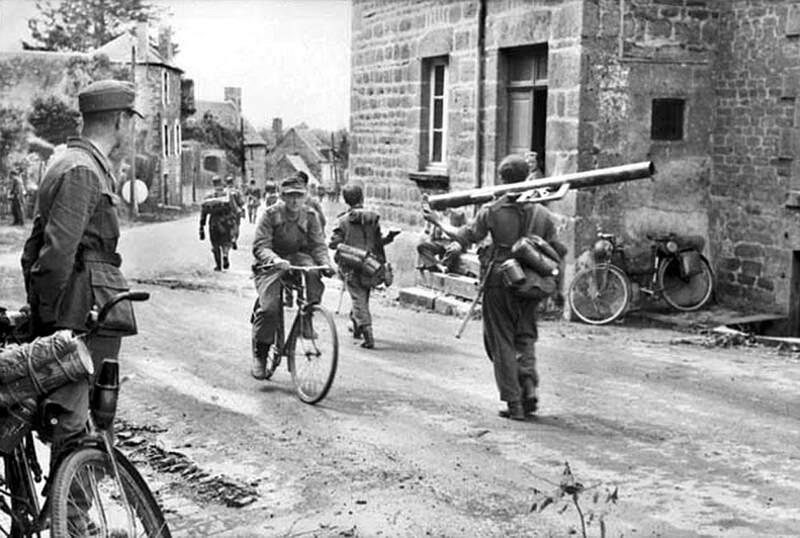 ​Shortly thereafter, a French civilian appeared who informed the Americans that a group of US paratroopers were approaching from the north with a captured self-propelled gun and a large number of German POWs, Sure enough, the group came into view but the defenders soon realised it was a trick. The `POWs` turned out to be well-armed Germans in American uniforms that had likely been stripped from the dead. 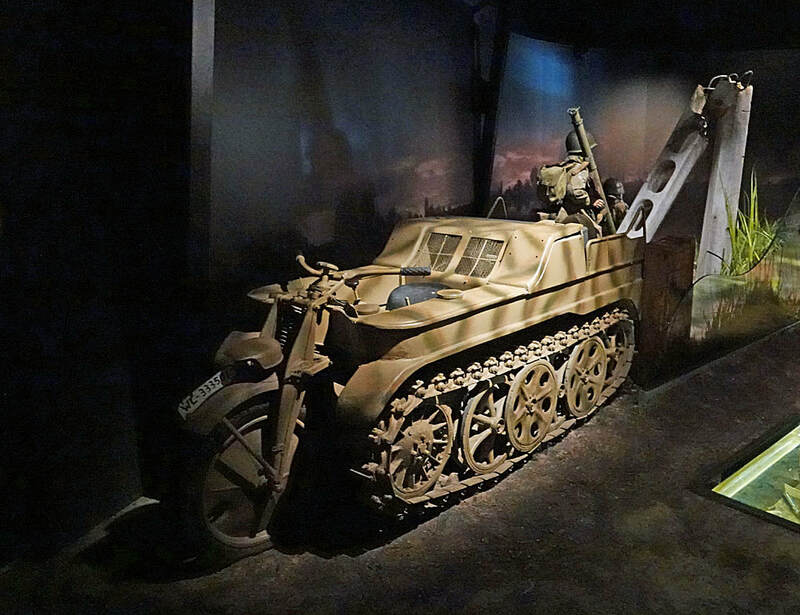 The lead Self-propelled gun and others following behind began firing, as did concealed mortars and machine guns. 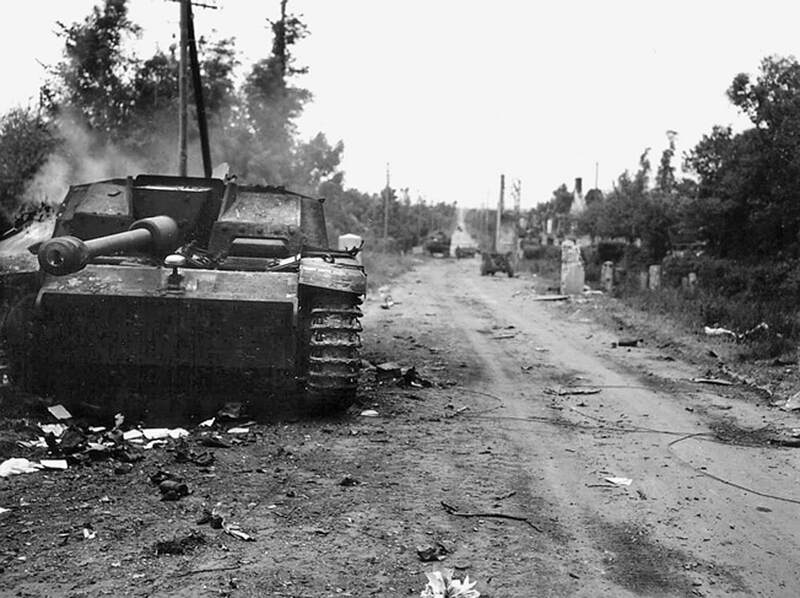 Above: A knocked-out German STUG assault gun lies smoking on the road leading from Neuville-au-Plain to Sainte-Mère-Église. Private John E. Atchley, H Company, 505th PIR, was credited with this `kill` using the 57mm antitank gun. 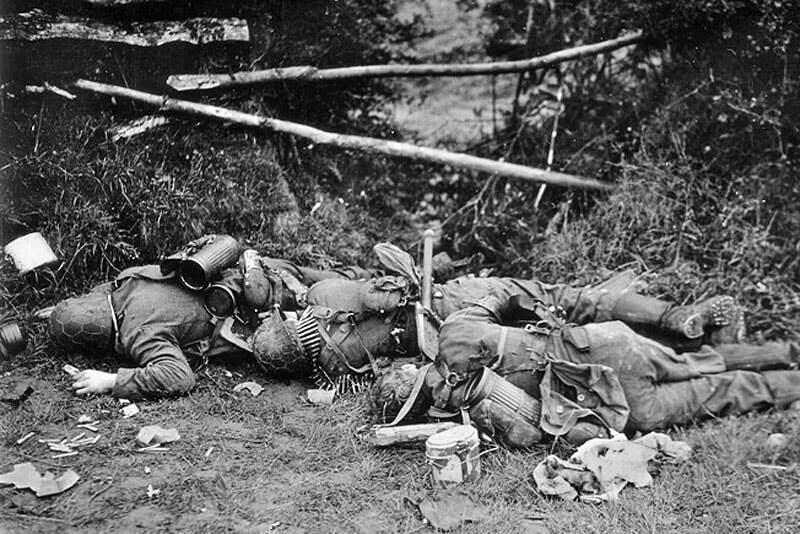 His prompt and effective action caused the German column to halt and seek shelter in the adjacent fields. 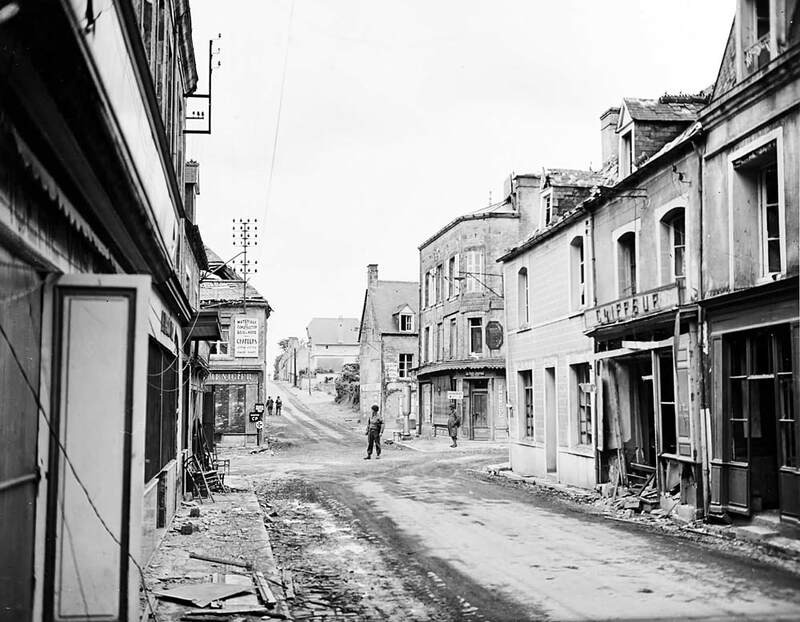 This street scene, and the one below, were taken on 10 June, after Sainte-Mère-Église had been captured by US forces. 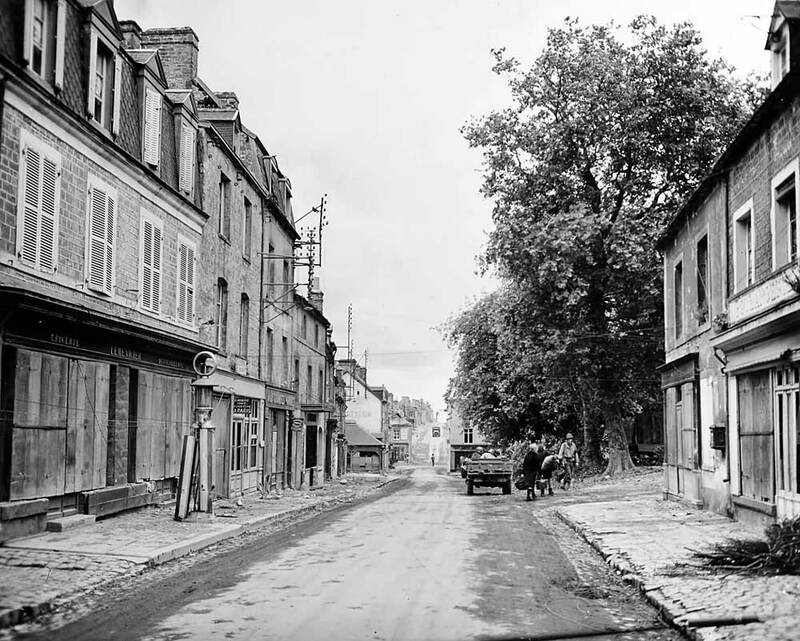 Vandervoort told Turnbull to stall the Germans as long as possible, then withdraw back to Sainte-Mère-Église; The colonel then departed to alert the troops in the main town that the enemy was coming. Turnbull’s men, despite being drastically outnumbered, held out for hours and foiled every attempt the Germans made to overrun their positions. 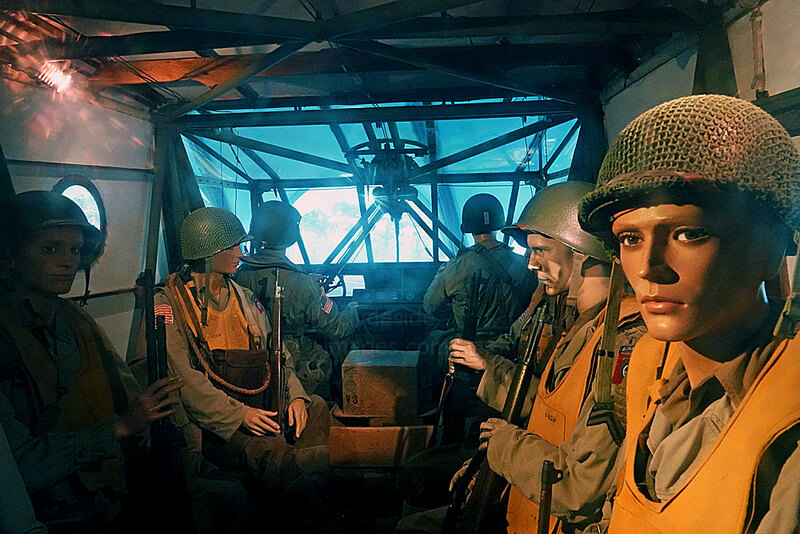 ​By 17:00 hrs, however, only 16 men were capable of action and retreat was the only viable option. As the survivors broke cover and started on the journey back towards Sainte-Mère-Église a fierce artillery bombardment came down and several men were hit including Turnbull who was fatally injured. For his bravery and leadership, Turnbull was posthumously awarded the Silver Star. 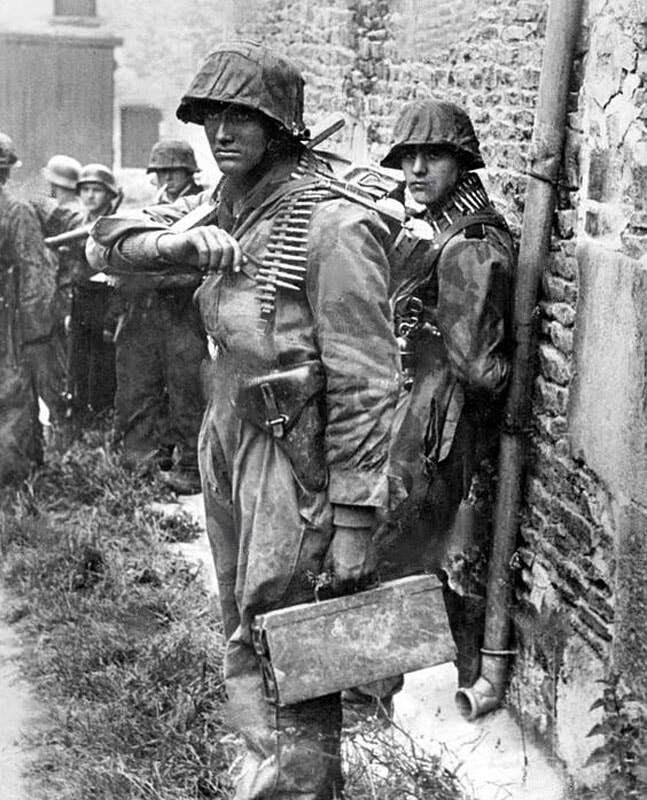 The 82nd retook Neuville-au-Plain the following day assisted by armour moving inland from UTAH Beach. 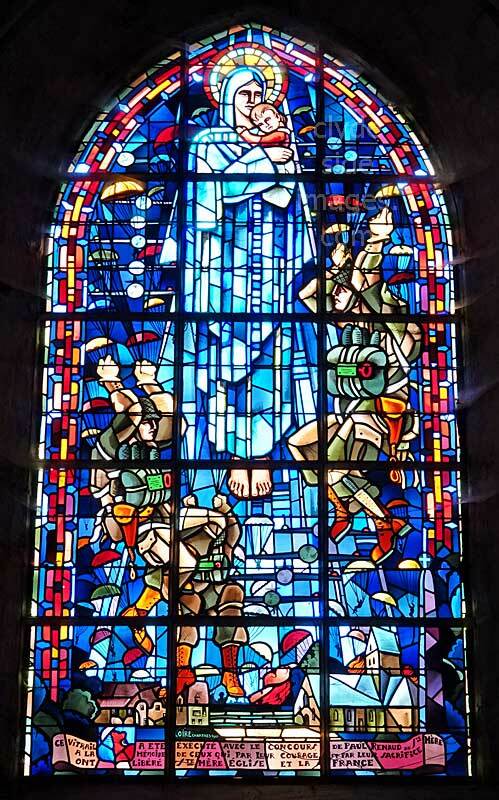 Like the battles for scores of towns and villages in Normandy, the war passed through Sainte-Mère-Église, then moved further inland, as tens of thousands of troops from the beaches joined the fray leaving hundreds of dead and wounded, not only from the combatants but also the civilian population. 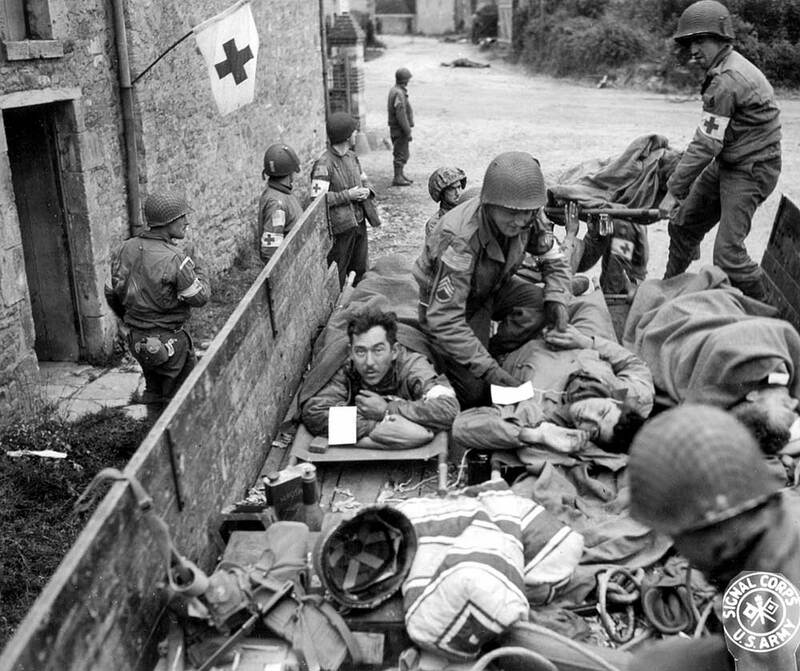 Below: Wounded US troops awaited evacuation from St Mere Eglise. 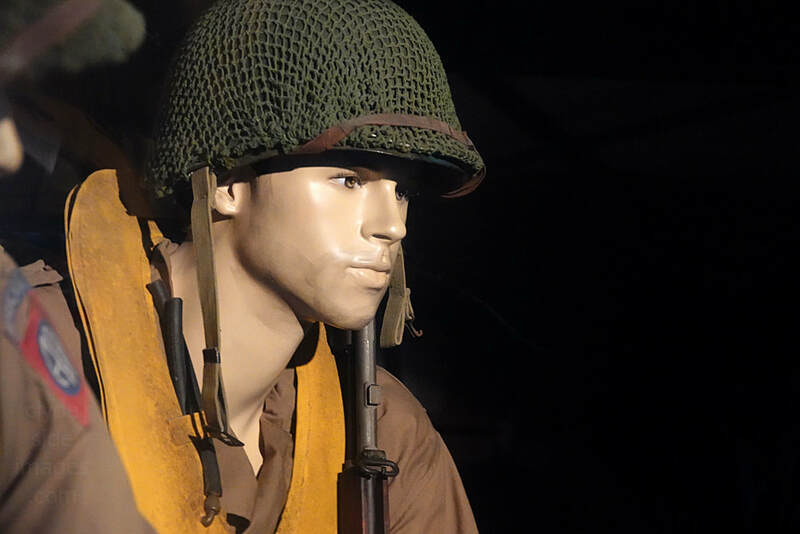 The US Airborne Museum is one of the `must see` sites relating to the D-Day Landings. 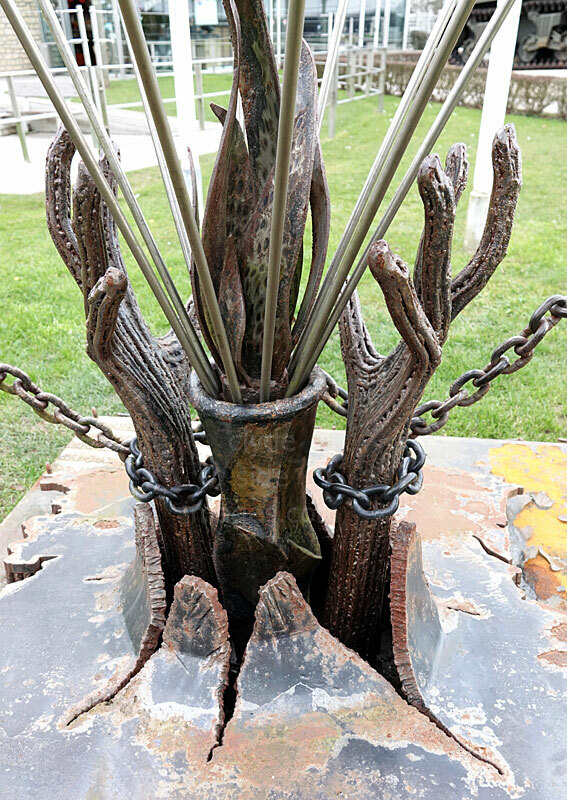 ​This sculpture near the entrance is titled "The Day They Came." A pair or shackled hands burst out from a raised map of France and reach toward an American parachutist falling out of the sky. 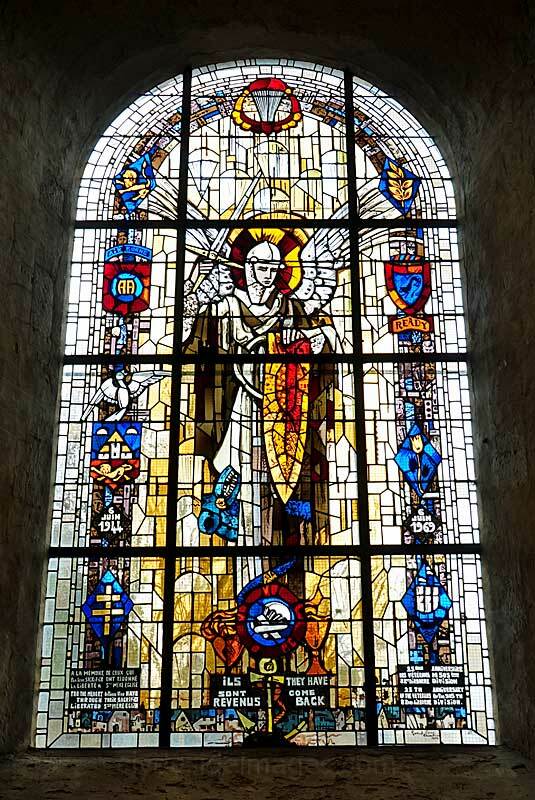 St Mere Eglise`s famous church is also represented. 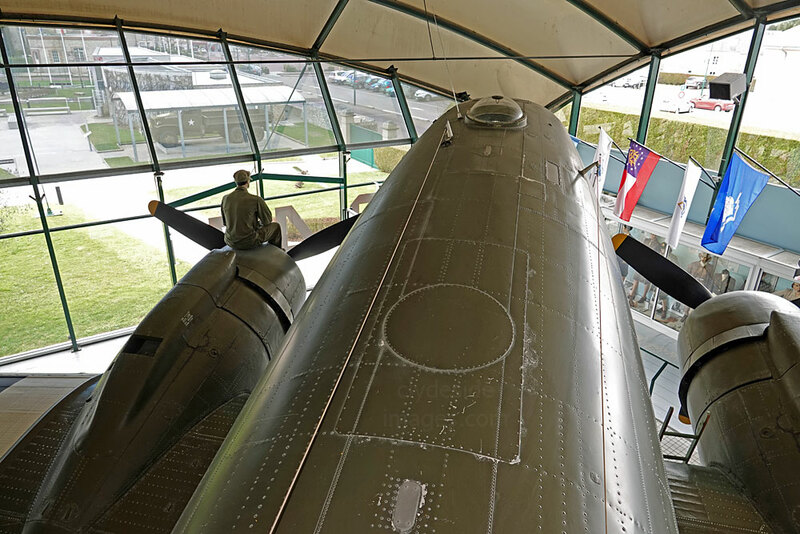 The Museum`s C-47 is displayed as `The Argonia` Serial number 43-15159, lead plane of the 439th Transport group. 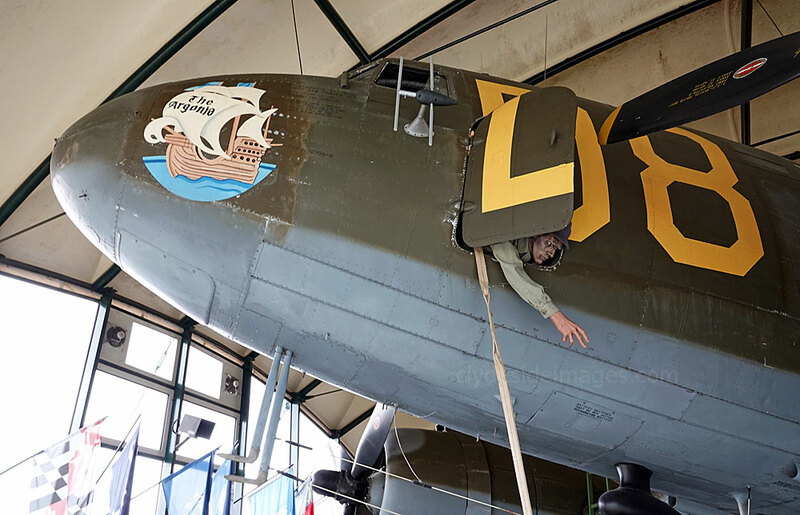 The aircraft left the Douglas factory in Long Beach, California, in December 1943 as serial number 42-100825 and was flown to England. It made a number of sorties over Normandy in connection with the D-Day Landings. ​On the night of 5/6 June 1944, it dropped a stick of Paratroopers from the 101st Airborne, and the following day it was back towing a glider belonging to the 325th Glider Infantry Regiment (GIR), 82nd Airborne, which it released over the bocage. It returned twice on August 15th dropping paratroopers from the 517th PIR, then returning to base to collect a WACO CG4A glider. 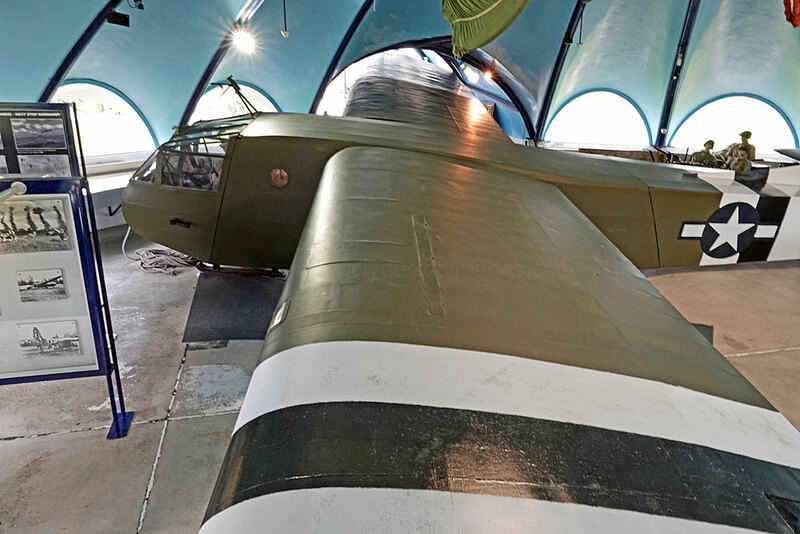 `42-100825` also participated in the ill-fated Operation Market Garden in Holland later that year, and in December dropped vital supplies to besieged troops at Bastogne during the `Battle of the Bulge.` After the war the plane was sold for commercial use and reconfigured as a DC-3. It was purchased as a trainer by a French operator in 1962 and carried out this role for the next 20 years. 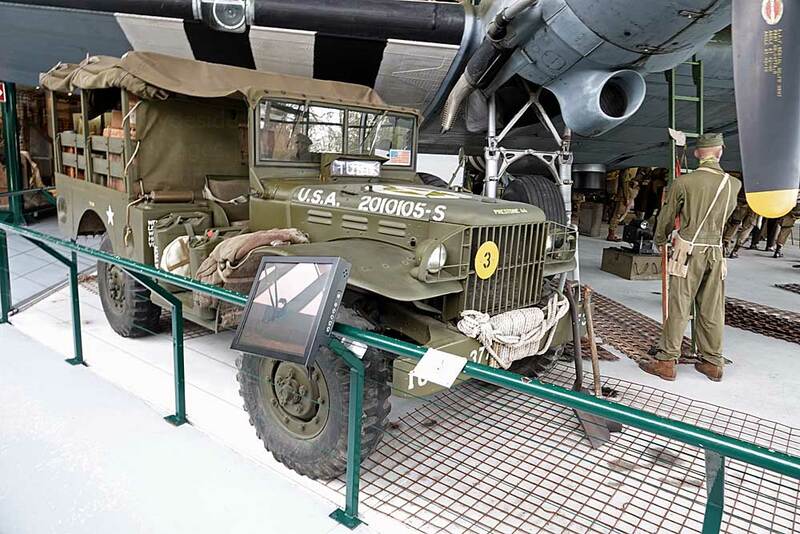 No longer airworthy, it was delivered to the museum in 1983 slung beneath a US Army helicopter. The Operation Neptune Building is on the left. 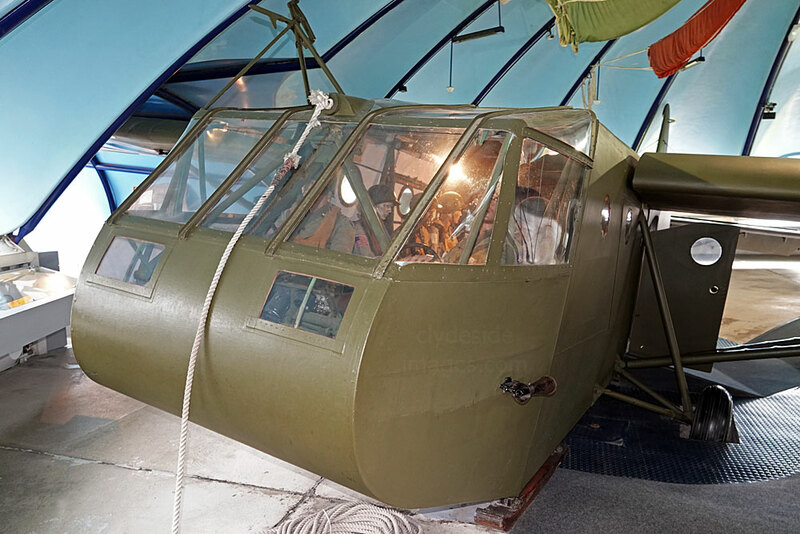 The building housing the glider exhibition, including the full-size Waco replica, is shaped like a parachute canopy. 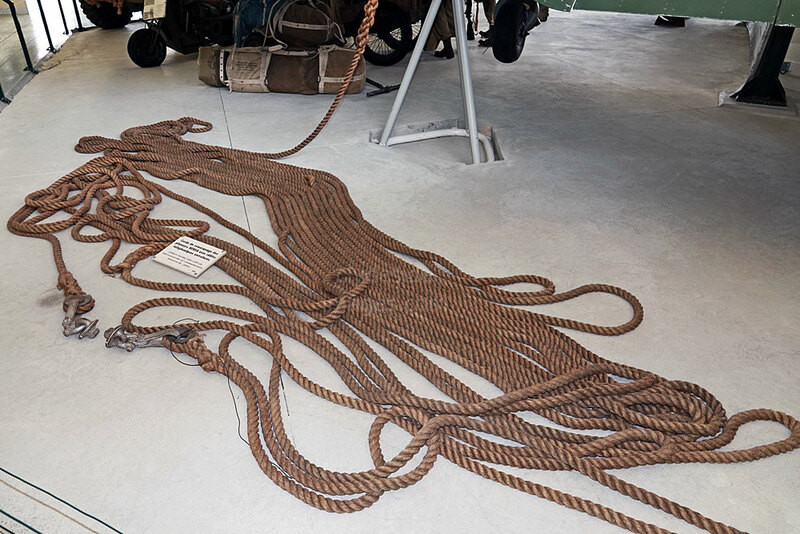 A glider tow rope and another view of the WACO glider. 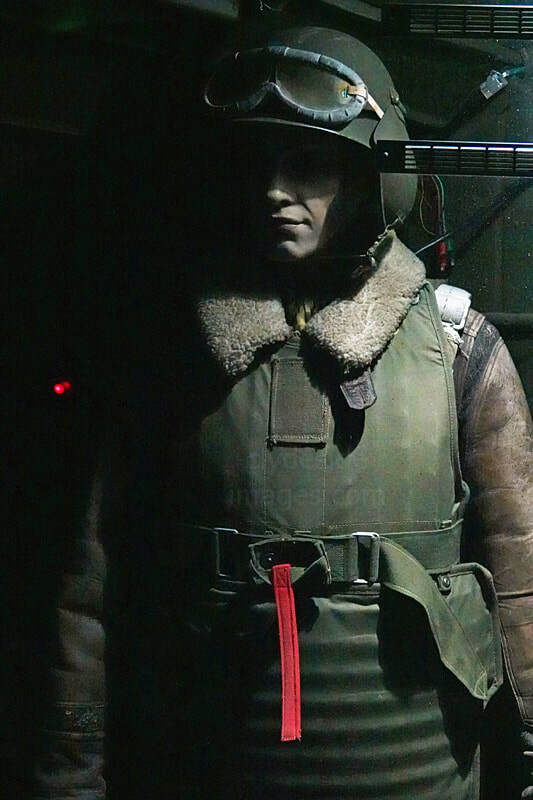 Like the ropes used by the British Airborne forces, the ones used by the American were fitted with a communication wire running full length so the crew in the tug, usually a converted heavy bomber, could communicate with the glider pilot via a microphone and provide him with updates on the proximity of the release point. Radio messages between aircraft could easily be monitored by the Germans. 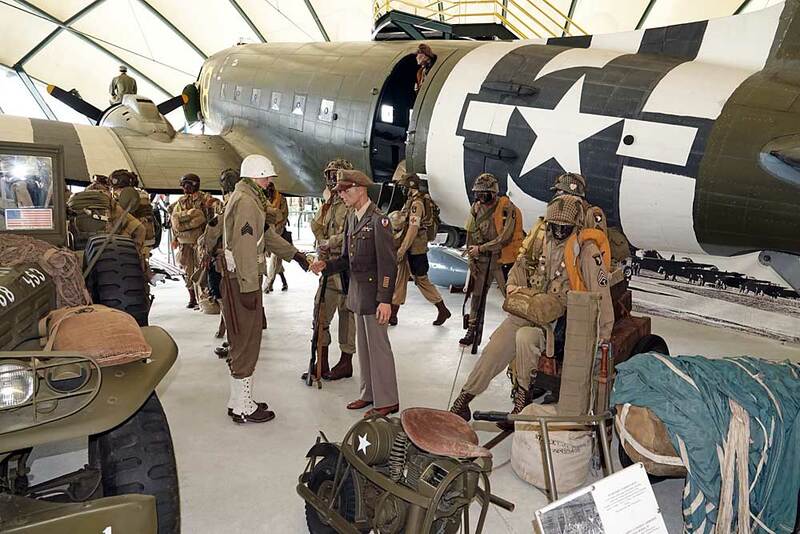 The Museum`s C-47 is surrounded by uniformed figures, including a mannequin representing General Eisenhower, a couple of vehicles and a variety of US Army Airborne equipment. A raised walkway above the plane enables elevated views of the scene. 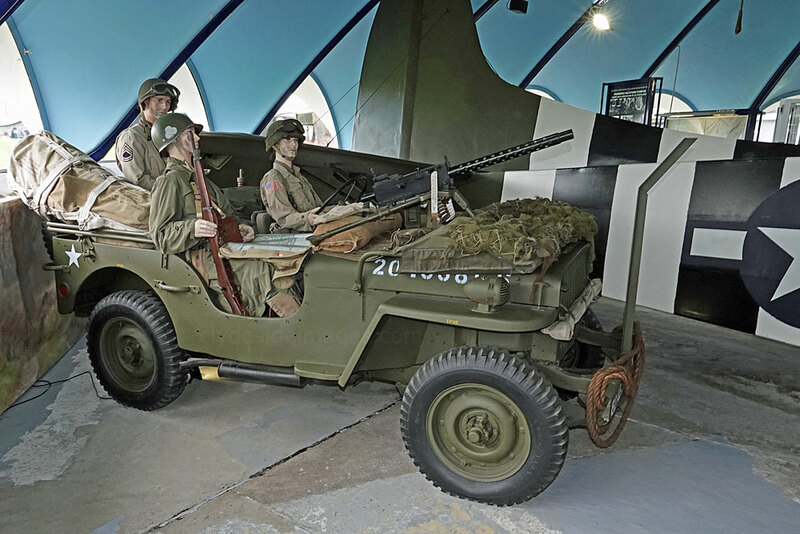 External exhibits include a Sherman tank `Channel Blues`, a GMC (General Motors Company) CCKW 353 truck, and several artillery pieces. 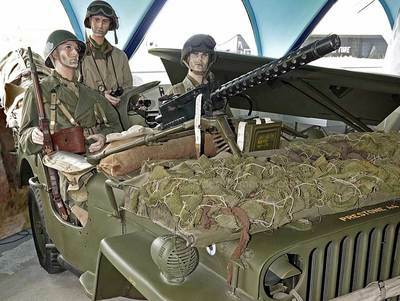 The GMC, or `Jimmy` to the troops, was a robust and reliable workhorse. Two versions were produced, the standard frame 352 model, and the longer 353 like this example which dates from 1942. 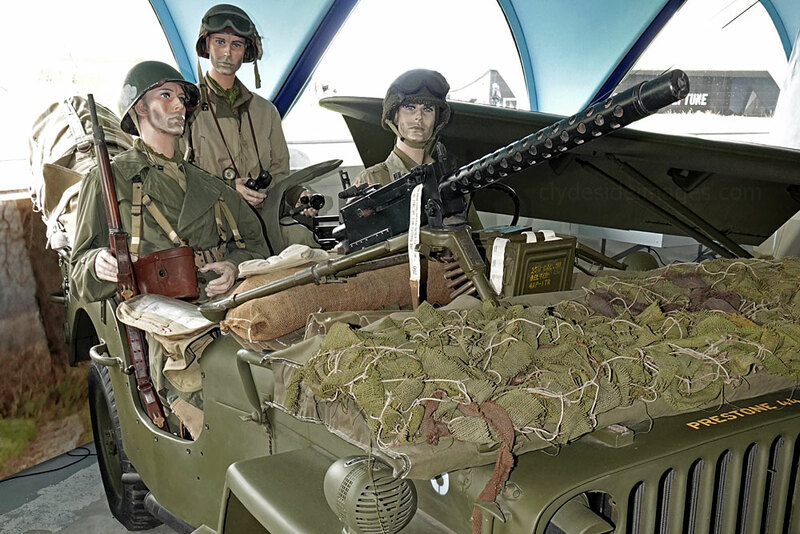 Many GMC trucks were adapted to perform specific roles and one in four was equipped with a ring mount above the cabin which could receive a Browning .50 calibre heavy machine gun. 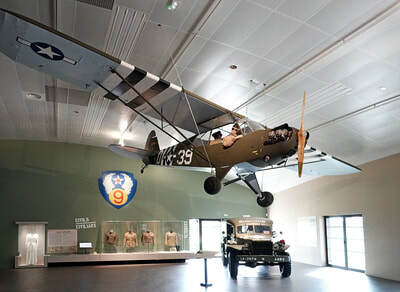 This L-4J Grasshopper, so named due to its tendency to bounce on landing, is on display in one of the main buildings. The type was developed fom the British Taylorcraft Auster V and proved invaluable for artillery spotting and communications duties. 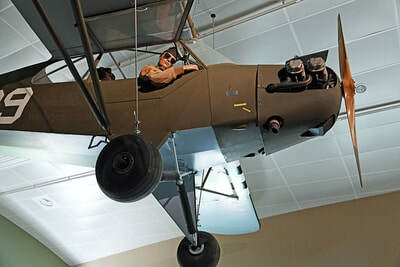 The plane could operate from fields and roads, enabling it to keep up with a rapidly moving advance and its slow loiter speed allowed it`s pilot to report on the accuracy of an artillery strike real-time and radio in any necessary adjustments. 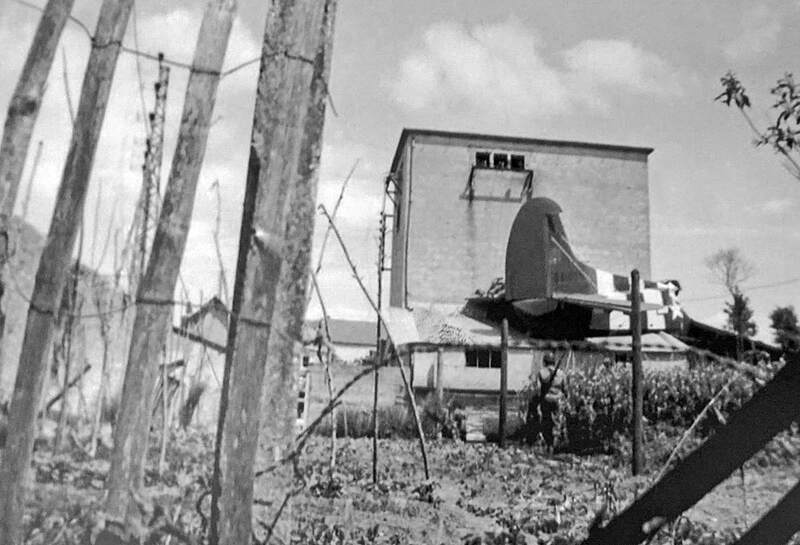 The main threat to these observation aircraft was from ground troops as the spotters`standard operating height was fairly low, a requirement to make them less visible to enemy fighters. Please bear in mind that all images on this website are Copyright. They are not free to use and have been embedded with a digital watermark. 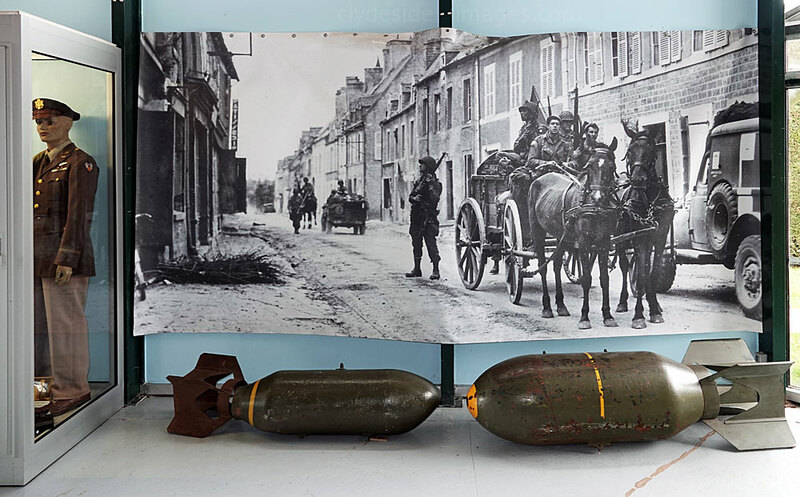 Any historic photographs from the Imperial War Museum and other organisations` collections have been used courtesy of a `Share & Reuse` policy and are also subject to copyright restrictions or are in the public domain. 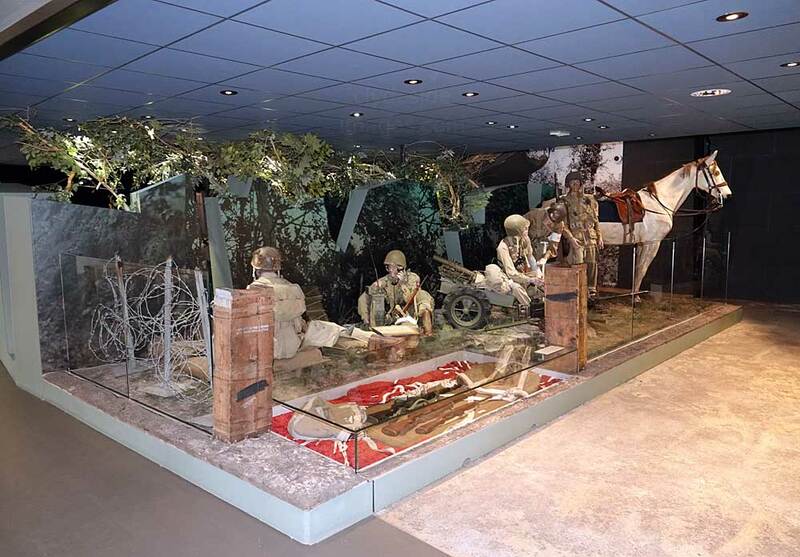 Displays include weapons, equipment, plus numerous photographs and documents relating to Airborne operations during the Normandy campaign. 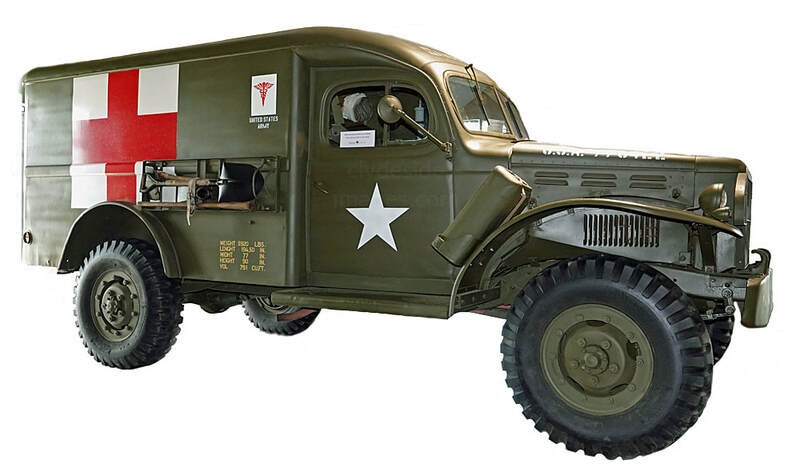 ​The Dodge T214-WC54 Ambulance was the standard US Army ambulance of WW II. It was used by the Medical Corps to transport sick and wounded personnel and served in all theatres of war with over 23,000 produced. The design was based on an existing ¾ ton Dodge chassis, but had a longer wheelbase and improved suspension. The vehicles were usually crewed by a driver and a medic with room for four to seven patients. After the war many Allied nations like France, the Netherlands, Greece, Belgium and Norway adopted the type. 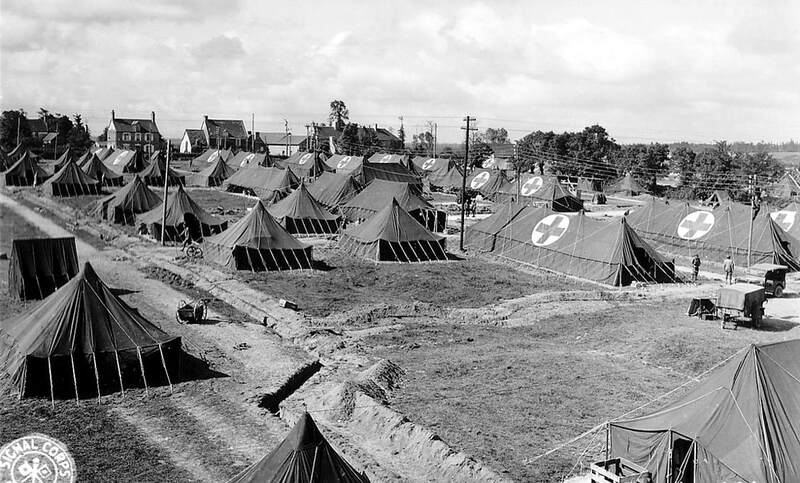 Two large tented U.S. hospitals were established in Saint Hilaire Petitville east of Carentan to process the rising number of casualties as the battle continued.